There are only three players in the history of the NFL to have amassed at least 300 receptions, at least 4,500 receiving yards, and at least 30 receiving touchdowns before turning 25: Randy Moss, Larry Fitzgerald … and Mike Evans (h/t to PFR). And yet Evans, who will turn 25 in August, still hasn’t really touched his ceiling. And after failing to deliver the goods in 2017, he’s primed to bounce back in 2018. Evans is a consensus top-10 fantasy wideout — but what is his ceiling? 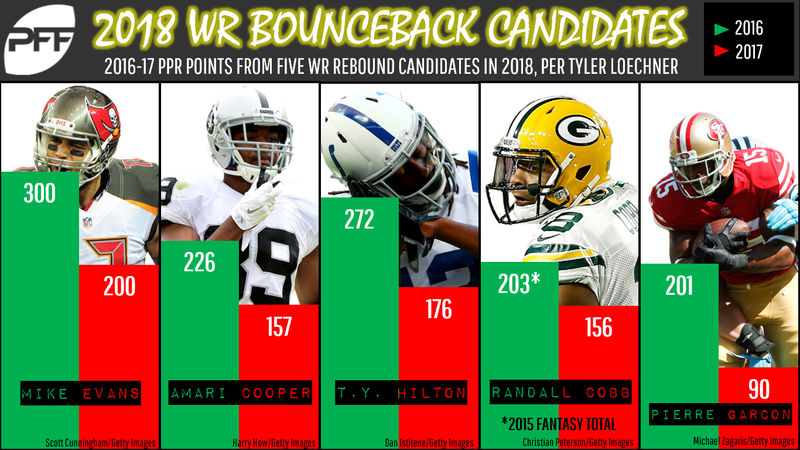 As of this writing, the PFF Fantasy rankers have Evans as a consensus top-10 wideout option in fantasy leagues for next year. Evans has been consistently good, gaining at least 1,000 yards in each of his first four years, but his touchdown production has been all over the place. He’s either fighting for the league lead (like in 2014 or 2016), or he’s seriously underproducing (like in 2015 and 2017). Perhaps the most frustrating part of Evans’ 2017 season was that he scored only five touchdowns despite leading the league in red-zone targets (41). He was also second in terms of targets inside the 5 (27), and second in end zone-targets (20). Based solely on where he was targeted on the field, we could have reasonably expected 10 touchdowns from Evans last season. Instead, he scored only five. The same thing happened to Evans in 2015, when he scored just three touchdowns before bouncing back with 12 in 2016. Through four years, Evans has frustratingly failed to meet the model, so if you want to throw your hands up and say that Evans and math don’t mix, I can’t get too mad. But if you trust the process, then you can trust that Evans will rebound in a big way in the touchdown department this season. Will Jameis Winston take a step forward? With Evans (and math), you are getting a base line of 70 receptions, 1,100 yards, and 8-10 touchdowns, which would certainly be enough to produce tail-end WR1 numbers. But Evans could blow the lid off of fantasy leagues if his quarterback improves. When passing from a clean pocket, Winston was accurate on only 74.1 percent of his passes last year — 24th in the NFL. He ranked 19th when passing from under pressure (61 percent). These aren’t good numbers. Unfortunately, this is more or less where Winston has been his entire career. If Winston can improve his accuracy, then Evans — who has a career catch rate of 53.3 percent — will obviously reap the benefits. It’s normal for someone like Evans to have a catch rate that seems “low” because Evans has a high average depth of target. But that also makes each Evans reception all the more valuable — especially because he is the most utilized end-zone receiver in the league. Positive regression alone will lead to a Evans bounceback season in 2018. An improved Winston could transform Evans into a league-winner. Cooper, who finished as the WR35 last year, gained just 680 yards in Year 3 after posting lines of 72-1070-6 and 93-1153-5 to begin his career. Cooper did score a career-high seven touchdowns last year, although that’s really searching for the silver lining. Cooper saw just 96 targets in 2018 after seeing at least 130 in each of his first two seasons. His drop struggles (17.2 percent, most in the NFL) could have caused QB Derek Carr to lose confidence in Cooper. But Cooper still has game-breaking ability, evidenced by his 11-210-2 eruption in Week 7 of last season. Assuming he can regain the trust of Carr (and regain some of his own confidence), he’s the most obvious bounceback candidate among receivers. Hilton’s 2018 line of 57-966-4 — good for the overall WR26 finish in PPR leagues — was decent, but not great. Hilton has never been much of a touchdown scorer (he’s never had more than seven), but scoring just four was tough when coupled with his 966 receiving yards, the fewest he’s gained since his rookie year. The return of Andrew Luck (fingers crossed!) would do wonders for Hilton’s fantasy #brand. Cobb is one of the forgotten men in Green Bay, and while there’s really no way to combat the argument that Cobb is past his prime, you also can’t argue the fact that he’s in a good spot. Cobb is Green Bay’s No. 2 receiver leaving into 2018 with a healthy Aaron Rodgers under center. Cobb is on a six-year streak of scoring at least double-digit fantasy points per game. He’s going to make it seven. Garcon was one of the unluckiest receivers in the league last year; he somehow scored no touchdowns despite seeing 65 targets (in eight games). But he returns in 2018 with Jimmy Garoppolo now throwing him the ball, and all signs point to Garcon’s touchdown-less streak snapping no more than two or three games into next season. Garcon was on pace for a respectable 80 receptions and 1,000 yards last season without Garoppolo. He’s one of the best WR3 targets in fantasy drafts this season.